Here in Southern California, land of amazing food, grown year-round, there is a fruit in season now called the cherimoya. Being an East Coast native, I had never seen one before, because cherimoyas have a very short shelf-life and therefore aren’t successful in commercial production. The yummiest, healthiest foods usually aren’t. 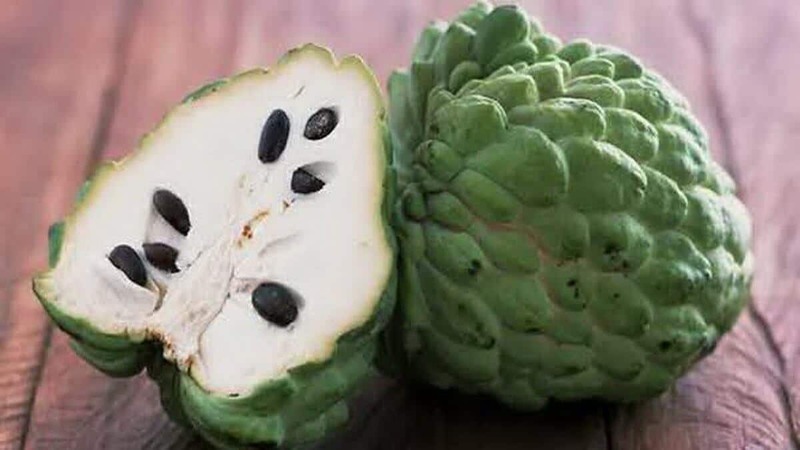 Sometimes called a custard apple, the cherimoya is related to the paw-paw, a yummy, rare fruit native to the Eastern U.S. (Pawpaws, I had seen!) Like the pawpaw, the unassuming, scaly-looking exterior of the cherimoya hides some of the most luscious, tropical tasting pulp I’ve ever enjoyed. Tasting like a cross between banana, pineapple and strawberry, cherimoyas are a true local delicacy. So, if you find yourself in Southern California, be sure to pick some up from your local farm market. Cherimoyas (Annona cherimola) are native to Ecuador, Bolivia and Peru, but they will grow in USDA hardiness zones 10-11. The greenish-yellow, conical fruits are borne on evergreen trees that can grow up to 30 feet tall. Cherimoyas bear fruits 4-5 years after planting. The cherimoya flowers are hermaphroditic and cannot self-pollinate. These flowers are female in the initial stage, but they later on convert into males. Therefore, they require a pollinator who can collect the pollen from the flower in the male stage, and deposit it back in its female stage. In their natural habitat, cherimoya flowers are pollinated by insects long evolved for their specialized pollination process (Coleoptera, Hemiptera). However, in the cultivated farms, pollination is largely done artificially by people to obtain good yields. Cherimoyas contain several poly-phenolic antioxidants (read: plant chemicals) that have been found to have anti-cancer, anti-malarial, and anti-helminthes properties. Cherimoya is very high in vitamin-C and is a good source of B-complex vitamins, especially vitamin B-6 (pyridoxine). 100g of fresh fruit provides 0.257 mg or 20% of daily-recommended levels. Pyridoxine helps keep-up GABA neuro chemical in the brain. High GABA levels calm down nervous irritability, tension, and headache ailments. Further, cherimoya is rich in copper, magnesium, iron and manganese, and in fact, contains more minerals per weight than many common fruits, like apples. Look for firm, unblemished fruits that feel heavy for their size. Ripe fruits turn pale green to light brown color and emanate fragrant rich sweet aroma that can be appreciated from a distance. Ripe cherimoyas will also yield to gentle pressure, like an avocado. To ripen a cherimoya, simply set them out on the counter at room temperature. The fruit can turn from a hard green color to full ripeness in 4 to 6 days. Once ripe, you can refrigerate them and they’ll last a few more days for you. The best way to enjoy a really ripe cherimoya is also the easiest: Spoon out the fruit, discard the large black seeds and season the pulp with a squeeze of orange juice. Cherimoya doesn’t hold up well to cooking, so enjoy it ripe, fresh and raw while it’s in season. Cherimoyas, like most tropical fruits, are high in water and fiber. You can substitute cherimoya in any recipe calling for your favorite fresh, soft, wet fruit. They are great in smoothies, yogurt and custards! A tropical, cold summer soup perfect for an appetizer or dessert. Chill all ingredients for at least an hour before preparing. Peel and seed the mango and cherimoya and cut them into pieces. Put the fruit, apple juice, milk, honey and cinnamon in a blender and purée till smooth. Pour into serving bowls, add garnish of choice, and serve. Enjoy as a bright, fresh appetizer or dessert! The name “cherimoya” really confused and intrigued me to read on. The I realised it was a custard apple! They are reasonably popular in Australia, you you are right about being limited coomercially. The only place to buy them is farmers markets, roadside stalls and small fruit shops. The big super markets dont seem to stock them. Luckily for me, my parents have several large trees, so we are able to slice and freeze them to enjoy year round. So good! I love cherimoya! I’ve never made a recipe with one. I just scoop right out of the peel and eat! It’s like a velvety tropical dessert. YUM! Next time I get my hands on one I will be making this smoothie for sure! Thanks for sharing this at Raw Foods Thursdays. I’m pinning it as well! Thanks for the wonderful information! Our cherimoya tree has one fruit and lots of flowers. I’m wondering if it’s like avocados, in that it has two seasons. You have to self pollinate the flowers if you want to guarantee fruit unlike other fruit trees. This requires collecting pollen and painting it on by hand if you want a big crop of fruit. Otherwise you are at the mercy of the lack of natural pollinators that exist for this tree. Thus the reason for such a high price in the supermarket and fruit stand. We are from NC and have never heard of cherimoya. It sounds wonderful. Thanks for sharing!